It's happened to us all at one time or another; an upset stomach after eating. You might not even know what caused the problem. Well, it may have been eating contaminated food. Foodborne illness is quite prevalent in the home, restaurants, hotels, retail establishments and yes, even in healthcare cafeterias. Through someone's carelessness, microorganisms were allowed to get on the food, which can occur with chicken, beef, pork, and a variety of other foods. Includes English, Spanish & Portuguese versions! Don't let your organization become the reason for a foodborne illness outbreak. HACCP: A Plan For Food Safety looks at why having a Hazard Analysis and Critical Control Points (HACCP) plan in place is a necessity to protect consumers from disease and your organization from negative publicity. Sanitation/Hygiene For Food Service Employees - Foodborne illness is quite prevalent in the home, restaurants, hotels, retail establishments, even school cafeterias. Bacteria is everywhere. Micro-organisms are everywhere. But there's a bright light at the end of the tunnel. 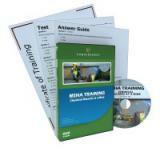 This 10-DVD video package offers a wide array of child safety training programs to help care providers keep kids safe. Foodborne illness is prevalent in the home, restaurants, hotels, retail establishments, and school cafeterias. Through carelessness, micro-organisms were allowed to get on the food. The program will touch on how food becomes contaminated, cleanliness, sanitizing, and food temperatures. Sanitation and Cleanliness in Food Service Establishments program covers carelessness, micro-organisms being allowed to get on the food. It's happened to us all at one time or another, an upset stomach after eating. You might not even know what caused the problem. Every individual in the child care system should review the information contained in this training program. Discusses food borne illness prevention techniques, cleaning, sanitizing, and much more. Did you know that heating food in plastic containers in the microwave can be hazardous and a potential carcinogen? 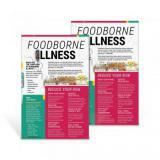 Features an interview with an adult who recently experienced food borne illness and explains his experience with this potentially deadly illness. The food safety concepts presented in this kit include proper food handling skills in buying, preparing, cooking and storing food, and handling leftovers. 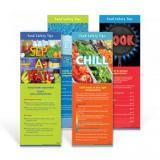 Keep food safe and prevent harmful foodborne illnesses with practical, sound advice found in the Food Safety for Older Adults Tri-Fold Brochures. 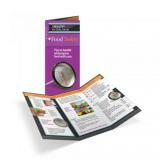 The pamphlet includes basic information tailored for senior adults based on the four principles of food safety: Clean, Chill, Cook, and Separate. Salmonella poisoning, E. coli, Listeria, Hepatitis, and Norovirus can all be contracted by poor hand hygiene and can have potentially deadly consequences.